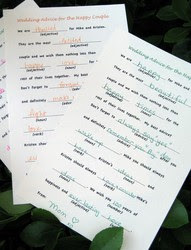 Pink Cupcake Weddings: Be Our Guest! 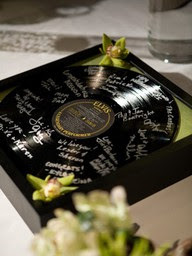 Guests can sign a framed record or a musical instrument. 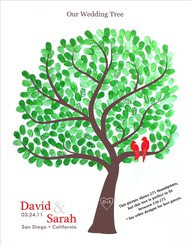 Guests can sign wine bottles that the bride and groom will enjoy on their anniversaries for the first five years of marriage (that's our guest book in the top pics, the bottles are on display on our bar!). 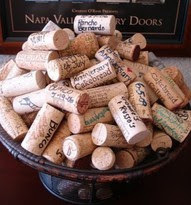 Or guests could sign a collection of wine corks. 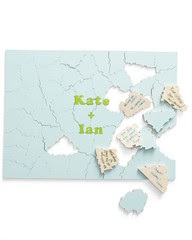 Have guest sign puzzle pieces or fill out Mad Libs about the couple. 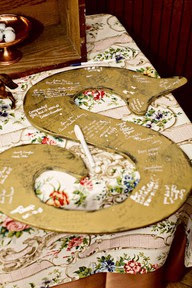 Guests can sign a piece of furniture or a large monogram. 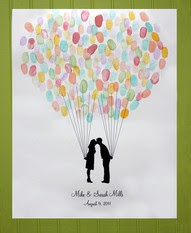 You could also have guests leave their thumbprints on an illustrated design. 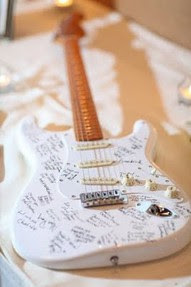 Your guest book doesn't need to be boring, in fact it should be something that represents you and your fiance. Don't be afraid to think outside of the box!